Google released the Chrome OS source and now everybody can create his own build. But how do you get your build image file on a botable USB stick? This tutorial describes the process step by step for machines running on Windows or Linux. It is assumed that you have your image file already on your computer. This means you have either built or downloaded it. Win32 Disk Imager a free piece of software that does the whole job for you. You can download it from here. Extract the zip file. After that, plug in your USB drive and run Win32DiskImager.exe. Click the blue folder icon and select your image file. In the Device area, select the USB drive you want to copy the image to. WARNING: All data on this drive will be deleted. Please make very sure you select the proper drive letter (verify with Explorer). 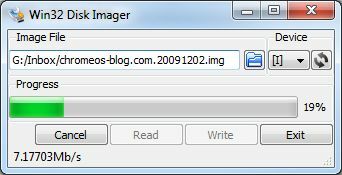 Win32 Disk Imager copies the file’s contents onto your USB drive. Check the progess with the progress bar. Plug in your USB drive. Open up a terminal window and type fdisk -l. You’ll see an overview of all your disks and partitions. Identify your USB drive by looking for its size. In my example below, my USB drive has a size of 65 MB and is called /dev/sda. Please make sure you identify the correct one as all data on it will be lost in the following steps. Consider yourself warned. I will refer to the USB drive as /dev/USB from now on to avoid confusion. Type dd if=image.img of=/dev/USB into your console where image.img is your image file and /dev/USB is your USB drive. Use a USB drive with a capacity of at least 4 GB. Once you are done copying your image onto your USB stick, you can boot from it. Switch off your computer and plug in your USB stick. Switch on your computer and enter the boot menu (F11 or F12 on most machines). Select your USB drive as boot device. That’s it. Please leave a comment below (no registration required). I don’t suggest to install it on your pc, less hardware works with it. I suggest to run it in VMware or something. I am doing that and it works great! ad 1) It is possible to install it on your PCs hard drive, Google included a shell script to do that. But I don’t recommend it either. It runs from USB as well. ad 2) You can find a tutorial on how to run it in Suns free software VirtualBox at http://chromeos-blog.com/tutorial-chrome-os-virtualbox/ . I’m trying to install jre in my chrome os as I found it possible after searching on the internet, but the problem is tht the root password, can you give me the password root(chronos) password? all good but on youtube i only see the sound , but i can’t see the video the screen of youtube it’s wihte. How do I change the ip address in chrome . hey can we do this on a cd? First of all, thanks for this step by step blog. 1. I executed all the steps, created USB drive, but when I reboot, I got into Chrome OS, but on the right side menu, it says that “Wifi” DISABLED .. I have a Wireless LAN port which connects to a Wireless router, and works hassle-free when Windows come up. 2. Then, I tried connecting my system with Ethernet, but that also, it keeps saying that Connecting (on the right top drop down menu), but eventually never connects. Any help on why Ethernet is behaving erratically. Mine N/w card if from NVIDIA. Is it among the not-supported ones. For Linux ver. I did it as described, and it done it well but after coping img to usb shows a message that says that can’t umount usb. As I later saw coping destroyed my usb file system. You have to partition and format it in order to get your 14.4 Gb back again. If i boot chrome os does it delete my old os on the hard drive? I followed everything the same way, by using a USB. But when i restart my computer and select my USB for Boot, the screen goes Blank..! and nothing further happens! I have downloaded chrome os for usb. Then wrote it on to the 8 gb usb pendrive with win32 image write. Now when I mount the usb and turn on the pc and press f12 and select the boot drive, a blue screen appears. nothing else. you are great , Man!!! you can try formatting it in FAT32 to see if will boot up. Thanks for the info, I’m up and running! Thanks to Windows at least. I still can’t write the USB drive from Ubuntu. Oh well, it’s not a big deal. I’ll get it some day.